“Made in China”. The disappointment most people feel when reading that label on product recently purchased is almost palpable. Or it used to be at least. These days there are some really exciting products coming out of China that are not only top quality, but often class leading. Particularly prevalent in the tech industry with companies like Huawei, DJI and Lenovo blazing trails in their respective industries, not to mention relative newcomers like Xiaomi making huge headway into the market, offering high quality products at affordable prices. People take a long time to put their faith in a brand and it’s quite obvious that the association of a brand to a country plays a big part in this too. On the automotive side you’ve undoubtedly heard such generalisations as “German build quality” or “Italian Styling”. French manufacturers still struggle with the perception of being unreliable across the board, regardless of the truth in the matter. So really it’s quite a testament to the concerted effort Chinese manufacturers have shown in order to turn perceptions around. With that in mind, the Landwind 5 is a true throwback to old school Chinese products. Sure it’s on the cheap side, with the flagship “AT 4×2 Flagship + Interactive Touch Screen” model coming in at a shade over R300,000, but it’s really disappointing to be reliving the old days where price was the only selling point. Alright maybe it’s not the only selling point, the 2L turbocharged engine actually produces a respectable 140KW and 250Nm of torque and gives the Landwind 5 more than enough grunt for most situations. It’s just a pity the automatic gearbox coupled to our test model seems to have a mind entirely of it’s own. Approaching a hill you’ll put your foot down to encourage the ascent of said hill, yet nothing will happen, the Landwind 5 still pretty convinced that cruising gear is what we’re going to need here. So you push a bit harder on the accelerator just in case the vehicles attention was elsewhere and needed stronger encouragement. Still nothing. Alright fine, I’m now actually going to start holding people up on the highway, time to floor it. After a long pause the gearbox suddenly springs to life, changes down somewhere in the region of 18 gears and the Landwind is off like a shot, shocking all inside it, including the driver who just wanted to maintain the 120kph they were originally doing on the N1 towards Pretoria. Quite sure this is also the reason for pretty poor fuel consumption, which was over 10l/100km on the open road. To be sure there are other cars that I’ve driven in my time that have had similar problems, but unfortunately this is just indicative of the Landwind 5 and the obvious ambivalence towards making a quality vehicle. The boot for example opens on the strongest and slowest hydraulics I’ve ever come across, meaning you have to wait an age for it to open and also have qualified for the world’s strongest man competition in order to close it. The Bluetooth system requires manually reconnecting each time you step on board. The radio could barely pick up the most popular and widespread of radio stations, and if you get fed up with this like I did you’ll quickly find that playing music over Bluetooth results in a constant hissing noise from the sound system. The worst part though was the hazard lights that are used for absolutely everything. Open your door with the key in the ignition and the hazards come on. Get home late at night after a long day at work and opening the boot to grab the shopping leads to a migraine inducing blast of the hazards while you desperately scramble around, now mostly blind, for the ingredients to that delicious lasagna you’d planned to make. These foibles could have been forgiven ten years ago when many of these features, that today are standard, were being perfected and worked out. 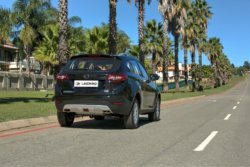 The SUV market is absolutely chock full of excellent vehicles from a variety of well established manufacturers and it’s no surprise considering the segment is practically the only growing one within the country right now. So with that in mind I really don’t understand who out there is going to put up with a vehicle that has so many annoyances to it. In fact, I find it rather insulting that we should have such a terrible vehicle thrust upon us and I can only think that the only people who buy one are those who accidentally wander into a dealership and buy it on the spot without taking the Landwind 5 for a test drive, let alone bothering to check out any of the competition.